No seats changed hands in the first council by-elections of 2015, but each result had its own interesting story to tell. What’s more intriguing is that there was a swing from Labour to the SNP of 12.8%. This is the level of swing that, if repeated at the general election, would see 11 Labour seats fall to the SNP. Given Labour currently has 40 MPs in Scotland, this sort of turnover would be nowhere near the kind of “wipeout” being suggested by some of the headlines of the past few days. The by-election took place in the Westminster constituency of Gordon Brown, which also happens to be the safest Labour seat in the whole of Scotland. The SNP are right to be pleased at holding the seat and producing such a swing, but it doesn’t follow that they are set to sweep all before them come the general election. Far from it. In Thursday’s other by-election, the Conservatives held a seat on Wealden council in East Sussex in a straight battle with Ukip. The Tories won 465 votes, Ukip 327. Ukip didn’t even fight this seat last time it was up for election. The same applies for a contest that took place on 9 January, which I missed (as did most of the news agencies). Labour held a seat on Bolsover council, but Ukip came from nowhere to take second place, pushing the Tories into third. 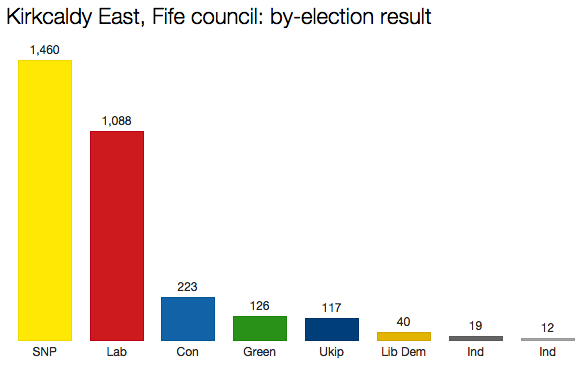 Labour won 174 votes, Ukip 153 and the Tories 60. Ukip’s appeal has clearly not diminished of late, despite the party falling out of the headlines over the past month or so. The swing to the SNP in this by-election is compared to the Scottish local election performance in 2012, when the SNP won slightly more votes and wards than Labour. Any swing in the general election would be compared to the 2010 general election, when Labour won 20% more of the vote than the SNP. Fair point James, though my observation about how many seats would fall to the SNP on that kind of swing is still a valid one. Whether they manage it or not is another matter! I’d have thought that if the SNP can get a swing of nearly 13% in the safest Labour seat in Scotland it bodes pretty well for them in the less safe Labour seats. Which seat might see the lowest turnout?